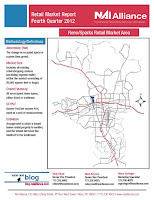 Click here to read the Northern Nevada Business Weekly's report on the Builders Association of Northern Nevada (BANN) Forecast 2013 event. Commercial real estate content provided by NAI Alliance - J. Michael Hoeck, Senior Vice President Industrial Properties, Scott Shanks, Senior Vice President Office Properties and Mark Keyzers, Senior Vice President Retail Properties. Trex Company leased a 337,500sf building at 2375 Newlands Rd in Fernley NV. Trex Company is the country's largest manufacturer of wood-alternative decking and railing products, marketed under the brand name Trex®. The company was formed in 1996 through the buyout of a division of Mobil Corporation and went public in 1999. Trex Company is headquartered in Winchester, Virginia, with manufacturing facilities in Fernley, Nevada and Winchester, Virginia. J. Michael Hoeck, SIOR; Michael Nevis, CCIM; Dave Simonsen, CCIM, SIOR; and Dan Oster of the NAI Industrial Properties Team represented the landlord and tenant in this transaction. Click here to view a PDF of the presentations of J. Michael Hoeck, Senior Vice President Industrial Properties, Scott Shanks, Senior Vice President Office Properties and Mark Keyzers, Senior Vice President Retail Properties from the Builders Association of Northern Nevada (BANN) Forecast 2013 event Tuesday January 15. Executives from NAI Alliance Commercial Real Estate were lead presenters on the commercial real estate market at the Builders Association of Northern Nevada (BANN) “Forecast 2013 and Beyond” event Tuesday January 15, 2013 at the Atlantis Hotel Casino. Expressing cautious optimism, NAI Alliance expects vacancy rates to drop 1 percent for each segment, but still maintain double-digit percentages ranging from 12.3% in industrial and 17.7% in retail spaces. You can read the full recap article written by the Reno Gazette by clicking here. The full presentations can be viewed on the BANN web site by clicking here. NAI Alliance provides market data and forecasts on the Commercial Real Estate market in Northern Nevada at the Builders Association of Northern Nevada (BANN) Forecast 2013 and Beyond event Tuesday January 15, 2013. For more information, read the full story by the Reno Gazette Journal. 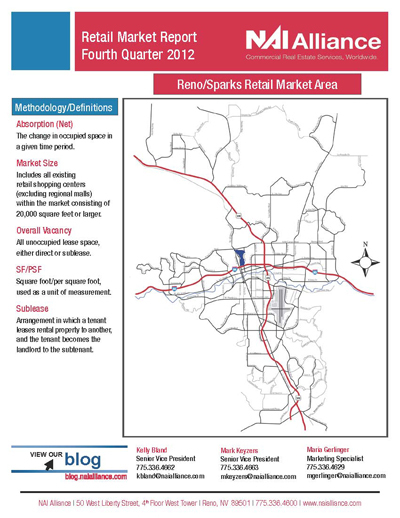 KOLO News Story on Shopping Center Vacancies Filling Up in Northern Nevada – NAI Alliance Senior Vice President/Principal of Retail Properties, Mark Keyzers, contributes to the story and talks about rental prices and conservative optimism for the future of commercial real estate.